Marathan runner Fiona Oakes is an “Ambassador” of The Vegan Society. 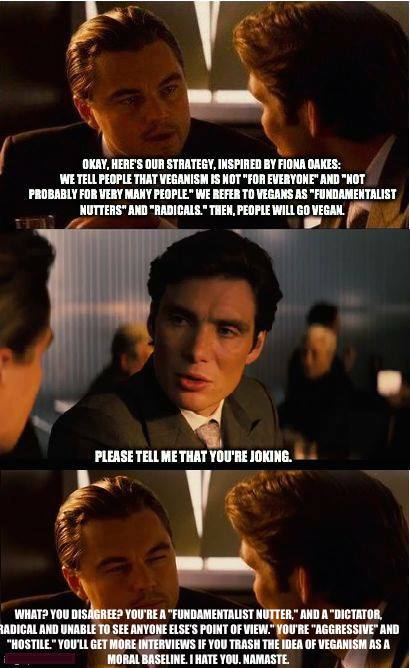 Ms. Oakes fits perfectly with The Vegan Society’s position that veganism isn’t a moral baseline; it’s just a matter of consuming vegan trainers, lipstick, etc. Veganism, which involves not eating, wearing, or using/consuming animals, is for everyone who believes that animals have moral value and are not just things. Indeed, veganism is the the only rational choice for those who believe that animals are not mere things. Ms. Oakes takes the approach that is taken by all of the bloated new welfarist “flexible-vegan” animal charities, including The Vegan Society: we cannot promote veganism as a moral baseline because that would be to tell people what to do, force people, dictate to people, be perceived as fundamentalist, radical, etc. That’s the whole point. I am sorry that Ms. Oakes missed it. And I am critical of your now attempting to cover by negatively depicting those who regard veganism as a moral imperative and saying that the alternative to selling out is forcing people and “dictating to everyone what they should and should not do,” etc. Ms. Oakes’ statement refers to the “masses” who won’t be able to understand veganism as a moral principle. What elitist rubbish. And what a convenient excuse for someone who wants to be as uncontroversial as possible because she thinks that is the way to get more radio spots. It’s a good thing that the slavery abolitionist movement was not dependent on people like Fiona Oakes. The slaves would still be picking cotton. But Ms. Oakes would be doing more radio shows. Creative, nonviolent vegan advocacy is the opposite of “forcing” and “dictating.” It is using reason, and commonly shared moral principles, to get people to see a moral issue in a different light. Fiona Oakes ought to try it sometime. It works. http://www.abolitionistapproach.com/wp-content/uploads/2015/09/aa_logo.png 0 0 Gary L. Francione http://www.abolitionistapproach.com/wp-content/uploads/2015/09/aa_logo.png Gary L. Francione2014-07-19 07:59:012014-07-29 06:16:37Vegan Society Ambassador Fiona Oakes: Veganism is not "for everyone" and "it's not probably for very many people."